The library of the priory of St Andrew at Rochester cathedral held an impressive array of books. 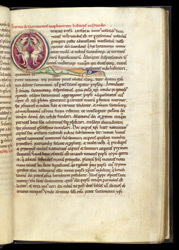 This 12th-century manuscript had commentaries on the sacraments and the letters of Ivo, bishop of Chartres. Probably it would have been useful for composing sermons as well as for theological and legal studies. Ivo of Chartres (1040-1116) was a famous teacher and an authority on canon law who contributed to the resolution of some troubling contemporary legal questions (investiture controversy). This manuscript was probably copied within living memory of him--he knew Anselm, archbishop of Canterbury, and other English churchmen. The first letter of this group of sermons is decorated with a pair of griffins--exotic imaginary creatures from western Asian art. They echo the patterns on silks and other luxury textiles which often found their way, via Byzantium, to 12th-century English cathedrals. A western European dragon, however, had to get in the picture, acting as the 'tail' of the letter Q.